I don’t remember what year I first went to the Lodge for Hogmanay. It might even have been 20 years ago. I went with my boyfriend of the time, and his family, and I was a little overwhelmed to be joining what was a family trip to stay with old friends. One of the very few photos I have from that time. 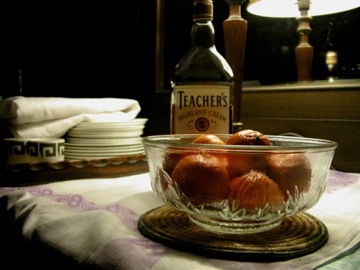 Of crockery and tea towels and Teachers and clementines. I might not remember the precise date. But I do remember how I felt. I remember a house filled with laughter, people and whisky. I remember wondering if the house was a TARDIS, because it seemed to expand to accommodate any and all comers. I remember singing and drinking and coal fired and the bells. And I remember the most enormous fry up the next morning. With slices of fried Christmas cake (sans icing and marzipan). I remember the steak pies. That were huge. And never ending. And there always being enough to feed everyone and more. It felt magical. I remember those things so vividly. That sense of togetherness. Of family and friends and hospitality. And I remember, when that relationship ended, feeling deeply sad that New Years would no longer feel like that. And somewhere deep inside I decided that if and when I could, that I would try to recreate that feeling in my own life. That I would work to make my home a welcoming place to friends and family. And their partners or paramours or persons of interest. That as far as we were able, we would welcome folk with open arms, good food and drink, and a clean, comfy bed if they needed or wanted it. And for the last few years, we’ve managed it. Through the year, but especially at the turn of the year. We host a Hogmanay party. There is always too much food and booze. But it works out ok in the end. Fried breakfast is available in the morning for those that want or need it. The Scottish kind. With black pudding and tattie scones. And fried fruit cake if we have any. And for lunch on New Year’s Day, in honour of the Lodge, I make a gigantic steak pie, and others arrive as the day goes on, and we sit down to steak pie (and often apple crumble for dessert) and it’s brill. My kitchen looks like a disaster area for 48 hours and I fear the knock on the door signalling an intervention from concerned recycling collection operatives, but it is worth it. For family, and friends who are pretty much family, and for being together. and lang may yer lum reek!